This morning on my drive to the office I called my folks. My Mom was filling me in on the adventures of her lambing. Lambing is what it is called when the ewes (pronounced “you”) have their babies. My Mom has about 70 head of ewes, and a ewe is a female sheep. A ewe can be bred to have babies at eight to 10 months of age. Her gestation length is five months. A baby sheep is called a lamb. 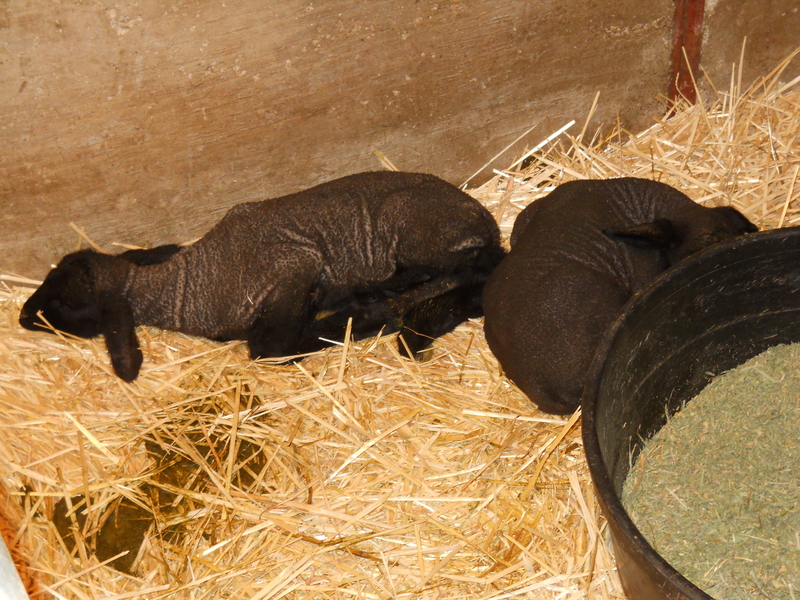 A set of twins (not the ones I will tell you about) sleeping on a warm straw bed under a heat lamp. Yesterday a ewe had twins (which is very common for sheep), but they were born outside, and the ewe didn’t clean them off very good (when an animal has babies they lick them to remove all of the embryonic fluid and dry them, while doing this they also “talk” to them by making low noises, which stimulates them to stand and nurse), and the lambs got very cold. 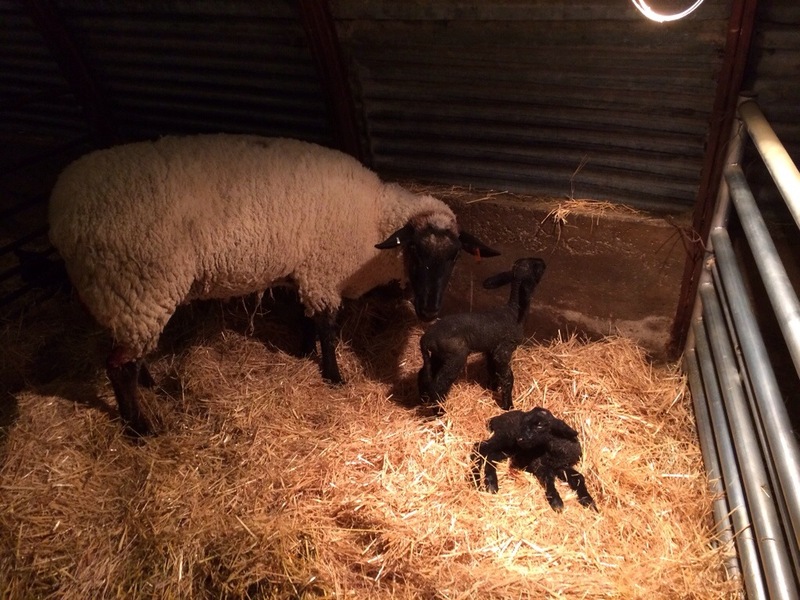 So the lambs were taken into the lambing barn and put under heat lamps. It is VERY important for all baby animals to receive the “first milk”, which is called colostrum. Colostrum contains proteins, peptides, and high levels of antibodies (these are the highest in the first milking), which aid in building a strong immune system enabling babies to fight possible infections. A new born baby does not carry antibodies since they do not pass through mother’s bloodstream into the placenta, but the lamb (or any other baby) can get these antibodies in the colostrum! 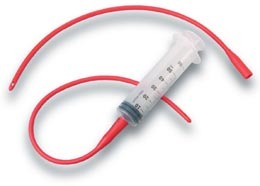 A lamb tuber with a very soft latex tube – used to feed colostrum. Since the lambs were not yet strong enough to stand and nurse on their own, the ewe was milked out by hand. The lambs were then tubed. In the sheep world, the feeding tube is a large disposable syringe that has a very soft latex tube that is slid down the lamb’s throat, past the esophagus, and into their stomach. This would look very much like a feeding tube that a human would have, but this is not permanent. The colostrum is put into the syringe and then once the tube is in the lamb’s stomach, the milk is dispensed and the tube is removed. This causes them no pain. Ensuring that the colostrum gets into the lamb’s system as soon as possible can mean the difference between life and death! A newborn baby may need to be tubed several times before it is strong enough to stand and nurse on its own. While the mother’s milk is ideal, sometimes a powder replacement is used or colostrum that has come from another ewe can be used ( it can be frozen and slowly thawed for later use). The lambs didn’t show much improvement after receiving colostrum, so they were taken into the house, yes the house that my parents live in, and put in front of the wood burning fireplace to warm up. This can be a common occurrence for livestock ranchers. Just like people, animals can get chilled to the bone and have a hard time warming up, so a toasty fireplace is a good place to go. We have had many lambs and calves (baby cows) in the house growing up. This is just what you do when a baby has gotten really cold or just isn’t getting off to the start you hoped it would. I can remember several times when we brought calves into the house, and after coming back in when chores were done we have found the calf has gotten up and has been walking around the living room! Yesterday afternoon the lambs were taken back out and put back into the heat lamp and straw warmed pen with their mom. Additionally, the ewes put off a lot of heat since they have a thick wool coat! My Mom shared they both made it through the night! Yay. 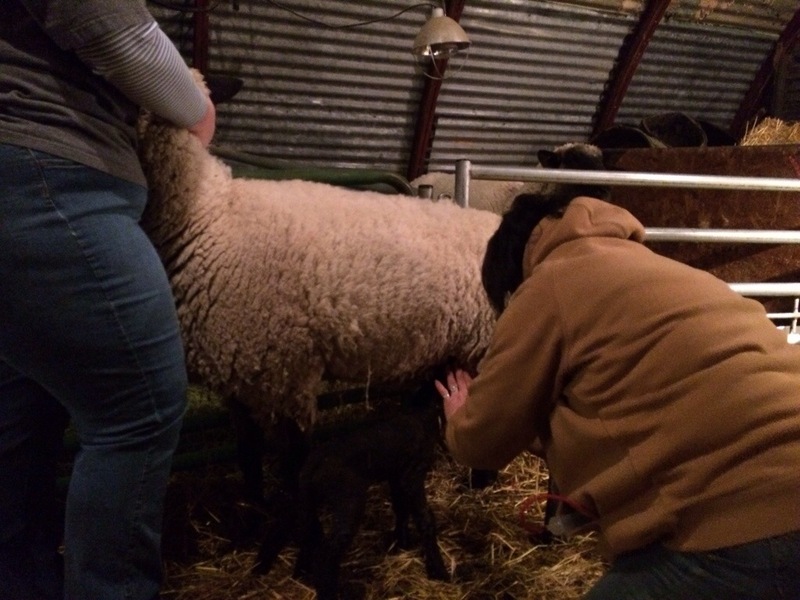 Today the lambs will receive help standing and may need assistance in finding the ewe’s teat to nurse, and they may even need to be tubed again just to make sure they are still receiving the nutrients needed to be healthy and out of the danger zone. Most lambs are born with no problems and never need the extra assistance from us as their caregivers. But if they do need that extra attention we are always there to provide it, both in and out doors! 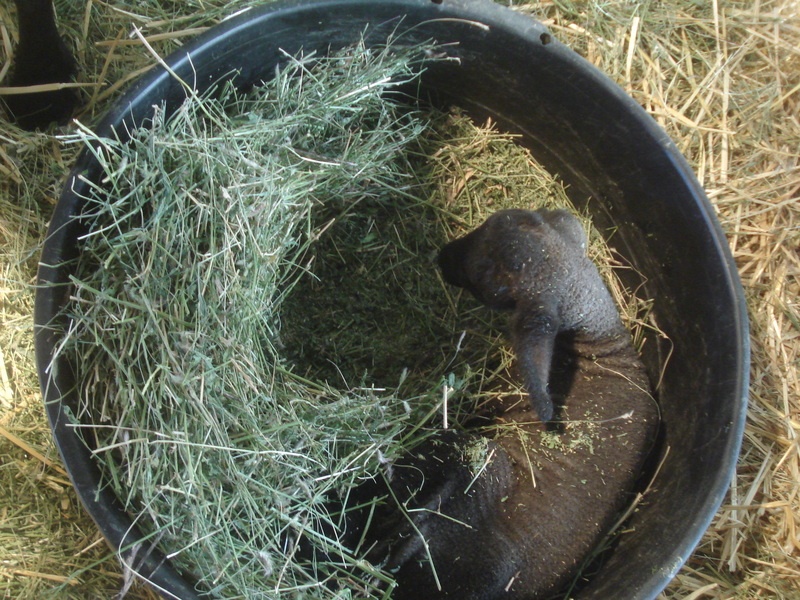 A lamb sleeping in its mom’s hay tub!